At year end, CFTC takes stock of what we’ve been able to accomplish and how we can best use your generous donations received over the course of the year to extend our partners’ work – granting them additional funds for projects and activities that have long been on their ‘wish lists’ but which we’ve not yet managed to raise enough funds to help them achieve. In 2014, thanks to the generosity of CFTC donors throughout the year, we were able to offer extra funds to our local partners to extend their work in some key areas. No more crying over spilled – or spoiled – milk! The school cooks and dietitian at Elsipogtog First Nation in New Brunswick have made great efforts to create a menu that is both economical and nutritious. However, budgetary restraints hindered their ability to address infrastructure issues that affect Elsipogtog’s capability to deliver the school food program at its best. 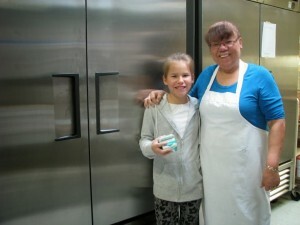 Elsipogtog First Nation School Cook Jean Anne Clement with student Erica standing in front of the brand new milk fridge. As of early January, 2015, Elsipogtog has a new milk fridge! A fridge, just for milk … why is this important, you ask? Well, because milk needs to be kept at a stable temperature to prevent bacterial growth. When large quantities of milk are in a fridge that is being opened and closed all day long for other items to be retrieved, the temperature fluctuates. Elsipogtog’s kitchen was functioning with a common-purpose fridge – bought used ten years ago, and subjected to numerous repairs since then. Worried about potential spoilage and hoping to save their precious food budget, CFTC provided the funds to purchase a state-of-the-art milk fridge. We also provided funding for some shelving to better organize the small kitchen space and keep food items off the floor for health and safety reasons. And remaining funds were used to purchase five new cafeteria tables to replace broken, cracked and worn out tables and ensure student safety. Year-end bonus for Ghana’s basket weavers! Given the limited opportunities for alternative employment and livelihoods in the Upper East Region of Ghana, CFTC’s local partner, TradeAID Integrated, has been supporting the craftswomen of the region through formal basket-weaving co-ops. The capacity building and skills enhancement of the women in these groups, which ranges from basic numeracy and literacy through more sophisticated business and marketing skills, has been tremendous. Multiple groups are located across the region – the poorest in all of Ghana – including in the communities of Vea, Yikene, Nyariga, Zoorbisi, Zaare and Zuarungu. Basket weavers of Sumbrungu, Upper East Region, Ghana will soon have a new craft centre. CFTC has directly contributed to constructing basket weaving centres in Vea and Zaare: large structures with locked storage rooms and a communal space for meeting, learning and working during all kinds of weather. 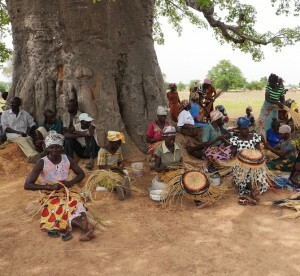 There has been tremendous improvement not only in the level of production but also in the quality of the products coming from these groups as a result of various interventions carried by TradeAID over the years, and in particular the construction of craft centres contributes to a more formal, better supported community to maximize productivity and income generation. The basket-weaving community of Sumbrungu currently does most of their weaving in the open air or in their own homes. The former means that in inclement weather, the groups cannot be as productive. And in the latter case, when basket weavers work on their own in their homes, the opportunity for learning from each other is reduced. Hence, TradeAID applied for and received a grant from CFTC to support the basket weavers of Sumbrungu to build their own craft centre! As of February 2015, construction was nearing completion. CEDO, Child Rights Empowerment and Development Organization, is one of CFTC’s long-standing partners in Uganda. Since 2010, CEDO has been implementing the “Tugende-Tutandike ECD/Nutrition” program in 18 villages in Masindi District in central-western Uganda, which seeks to ensure that participating households and the community provide a protective environment for young children to ensure they grow up free from neglect and abuse; that children are born and raised during their first five years in conditions that ensure their survival and optimal physical development; and that young children enjoy a caring and stimulating environment, both at home and within their community where they can explore, learn, and socialize. Plenty of cups makes serving porridge easier! Last year, CFTC donors generously supported the construction of an early childhood development (ECD) classroom block at Kababiito ECD centre, and provided it and two other ECD centres with operating funds to provide educational supplies and school feeding. In 2014, 480 children under the age of six were supported in the three ECD centres in Masindi District. 1. Construction of a kitchen at the new Kababiito ECD Centre: students from the five villages that form the Kababiito community now benefit from a new kitchen plus storage shed, which means healthy meals can be prepared on site. Previously, the children’s daily porridge was prepared under a makeshift shelter, often interrupted by rain. 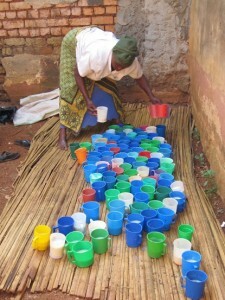 The construction of a permanent kitchen reduces risks related to poor sanitation and hygiene at this learning facility. 2. A new five-seat latrine is under construction at Nyakyanika ECD Centre, replacing the temporary pit latrine dug to coincide with the opening of the ECD but insufficient for the number of students and teachers at the school. 3. Plans for opening day events at the Aviobolo, Kababiito and Nyakyanika ECDs will showcase children’s achievements and help build interest and community involvement in the growth and sustainability of the ECDs. These events, which will be covered by local media, are also vitally important to engage technical staff from the District’s ministry of education, raising the profile and building collaborative relationships between parents, community leaders, teachers and staff with government officials for ongoing policy and funding dialogue to occur. 4. With additional funds, CEDO was able to purchase water containers, school bags and drinking cups for the 450 children in the schools. These, retained at the ECD, support school feeding and increase school attendance. 5. The schools are currently staffed by nine volunteer teachers who live in the project villages. These volunteers are tasked not only with supporting students at each centre, but also making home visits to follow up with children who drop out or are at risk of dropping out. To facilitate these visits, funds were used to purchase bicycles: three for each centre. These bicycles will remain the property of the ECD centre and make the job of supporting these young students much easier for those who give of their time so generously! Our local partners in Bolivia work hard to create safe spaces for children to play, learn and grow despite the many challenges posed by parents’ struggles to earn good incomes. Without adequate child care facilities such as those offered by SCSJ and IPTK, which include early childhood education centres and after-school centres for older students, children in Bolivia are often left alone, in the inadequate care of older siblings, or must accompany their parents to dirty, unsafe factories or fields without any opportunity for stimulation, education or support. 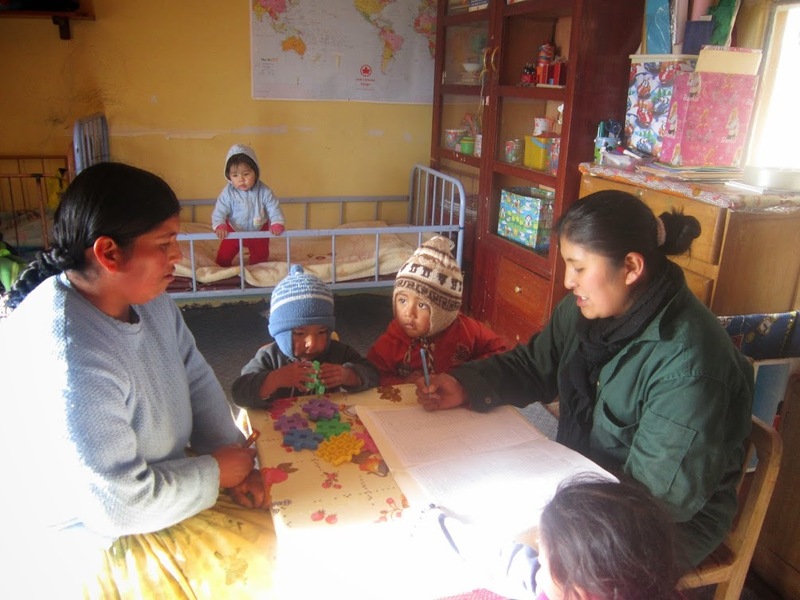 ECE and after-school centres fill crucial gaps in Bolivia’s education and social services systems, enabling the youngest children to survive and thrive during their first six years and keeping older ones safe and healthy in structured, supportive after-school centres. But these centres always need infrastructure and additional supplies and supports to ensure the playing and learning is done in clean, safe environments that provide optimal physical and social stimulation. We were delighted to be able to offer IPTK funds for safe outdoor playground areas for children at early childhood education centres in La Barranca and Sojta Phata – both located in a very impoverished rural and mountainous region around the capital city of Sucre. As of early 2015, the two playgrounds will have slides, swings, carousels and seesaws to provide not only the space for children to get the exercise their bodies need to stay healthy, but also the opportunity for children to play safely outside, have fun, and just be kids!